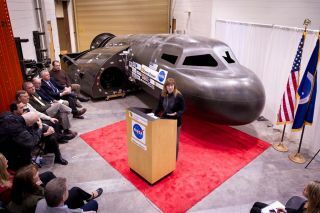 NASA Deputy Administrator Lori Garver talks during a press conference with Sierra Nevada's Dream Chaser spacecraft in the background on Saturday, Feb. 5, 2011, at the University of Colorado at Boulder. Sierra Nevada's Dream Chaser spacecraft is under development with support from NASA's Commercial Crew Development Program to provide crew transportation to and from low Earth orbit. NASA is helping private companies develop innovative technologies to ensure that the U.S. remains competitive in future space endeavors. BOULDER, Colo. – NASA's focus on the value of innovative commercial space firms took center stage in back-to-back meetings with a private space station module builder and a company developing a new space plane to fly passengers to and from Earth orbit. The meetings were led by NASA's deputy chief Lori Garver, who traveled last week toinflatable space modulebuilder Bigelow Aerospace in Las Vegas and then visited the company Sierra Nevada, based here, to check on the progress of its Dream Chaser spacecraft. In a briefing Saturday (Feb. 5) at the University of Colorado at Boulder, Garver spotlighted NASA’s partnering with the commercial sector to develop innovative technologies of value to space agency aspirations. Real space hardware is being built in "a rapid and unprecedented way," Garver said, with NASA recognizing that the government can’t and shouldn’t do everything. “We’re looking to loosen our grip and allow companies to do those things in low Earth orbit that we’ve been doing for over 50 years," Garver said. Garver’s visits with space entrepreneurs groups included Feb. 4 discussion with Bigelow Aerospace president and founder Robert Bigelow, a Las Vegas-based general contractor, real estate tycoon, hotel businessman and developer. In 2006 and 2007, the space company launched orbiting space station prototypes, Genesis 1 and Genesis 2. Garver and Bigelow discussed several issues, including the prospect for a Bigelow Expandable Activity Module (BEAM) – an inflatable room for the International Space Station. BEAM would be a larger version of the already flown Genesis-type unit. NASA Deputy Administrator Lori Garver talks with Bigelow Aerospace President Robert Bigelow prior to touring their facilities on Feb. 4, 2011 in Las Vegas. NASA has been discussing potential partnership opportunities with Bigelow for its inflatable habitat technologies. But Bigelow has his sights on a grander adventure: Building the first of multiple, fully-functioning stations by 2015. The initial "Alpha" complex would consist of Bigelow's large Sundancer and BA 330 modules. "How exciting to see that government isn’t the only one interested in doing things on-orbit," Garver told SPACE.com regarding Bigelow's plans. "And guess what they need? They need transportation services." Currently, NASA has deals in place with two other private companies to provide unmanned cargo delivery services that will keep the International Space Station stocked with supplies once the agency retires its shuttle fleet for good later this year. Under those deals, California-based Space Exploration Technologies (SpaceX) will provide deliveries using its Dragon capsules and Falcon 9 rockets. Orbital Sciences Corporation in Virginia is NASA's other commercial partner in the venture, and is developing Cygnus freighters and Taurus 2 rockets to provide the service. Meanwhile, Bigelow Aerospace has been busy hammering out new agreements to spur customer use of the firm’s expandable, orbital space complexes. The company is currently on the road marketing a variety of individual spaceflight programs, tied to an array of duration and pricing options, including an option of $28,750,000 for a 30-day astronaut visit. A Memorandum of Understanding between the Emirates Institution for Advanced Science and Technology (EIAST) and Bigelow Aerospace was announced on Jan. 31. That deal is geared to explore joint efforts to establish a next-generation commercial human spaceflight program for Dubai and the United Arab Emirates. According to Bigelow, if the company attracts enough customers to lease all of the orbiting, inflatable modules on the company’s Complex Alpha, it could mean up to 25 launches a year -- possibly from Cape Canaveral -- to ferry cargo and crew into Earth orbit. Module launches could be accommodated by current United Launch Alliance Atlas 5 rockets or other vendors, such as the SpaceX Falcon 9 booster. One day after visiting with Bigelow's team, Garver visited the brains behind the Sierra Nevada Corporation's (SNC) Dream Chaser spacecraft. Her Feb. 5 visit with the Colorado-based company stemmed from the partnership being carried out under an award of the space agency’s Commercial Crew Development (CCDev) program. SNC’s Space Systems Colorado in neighboring Louisville has also partnered with the university to draw upon hands-on student talent in design, test, and human-rating aspects of Dream Chaser. The seven-person Dream Chaser vehicle is based on NASA HL-20 lifting body work, a legacy design completed in the 1980s and 1990s at the space agency’s Langley Research Center in Hampton, Va.
Dream Chaser would fly to the International Space Station and back. The vehicle is slated to launch vertically on an Atlas 5 rocket and land horizontally on conventional runways. According to former NASA astronaut, Jim Voss, vice president of SNC Space Exploration Systems, Dream Chaser is taking shape with modern methods and materials. The core structure of the craft will become an atmospheric flight test vehicle, to be taken to high-altitude and released by the White Knight Two mothership, built by as part of a space launch system by Scaled Composites of Mojave, Calif., to support Virgin Galactic’s suborbital spaceliner business. "We’ll do approach and landing tests much like what was done for the space shuttle before it flew into space," Voss told SPACE.com. "We plan to be ready for drop testing by May 2012 if we are aggressive and work more quickly like we did during CCDev 1…then we expect to be doing our drop testing at that time." Voss said that drop testing via helicopter of a Dream Chaser scale model in December was carried out at NASA’s Dryden Flight Research Center in California. The 88-pound (40-kilogram) model was designed, built, and operated in collaboration between SNC and the Research and Engineering Center for Unmanned Vehicles at the University of Colorado at Boulder. Mark Sirangelo, head of Sierra Nevada Space Systems and a corporate vice president, spotlighted the harmony needed between government, industry, and academia to work on Dream Chaser. "Space is not a solo sport. You don’t do it on your own. You need a team. You need a village to make that happen," Sirangelo said. Sirangelo pointed out that "It’s a very interesting time. Everyone sees that it’s a difficult time in the space industry … certainly a difficult time in the budget world." Under the NASA CCDev award, Sirangelo said that the company has met all of its milestones, announcing that "we’re on time, actually under budget." He added that Dream Chaser will become a fully capable suborbital vehicle on the way to reaching orbital capability. Concerning the work of Bigelow, as well as his enterprise, Sirangelo said it’s all about building infrastructure together. "NASA didn’t invest in this program to take people to the space station. NASA invested, in my view, in this program to help build and spur industry," Sirangelo said. "There are many markets that we are looking at that really justify the nation’s investment in this … as well as our investment." Garver said that NASA's partnerships with commercial space efforts "truly are our collective future” to help the U.S. win that future by out-innovating, out-educating and out-building our competition around the world. "The entrance of the entrepreneur into the field that has been dominated by government investment is now poised for rapid commercial growth," she added.